So I bought a new kitchen gadget yesterday. I remembered this one Russian dish that my mom used to make (and still does) when I was little. It’s called Macaroni po-flotski. (to translate into English: ‘Sailor’s Macaroni’). In order to make the recipe, it’s required that you have a meat grinder. I found one at Bed Bath and Beyond yesterday, it’s actually an attachment – which will work wonderfully with my KitchenAid stand mixer. 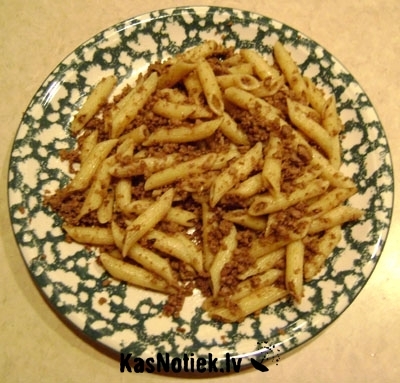 Macaroni po-flotski is a wonderful dish for everyday menu. The name comes from the marine. This dish is usually served to sea men, because it is really easy to make. Macaroni po-flotski is a perfect dish for new cooks, there are only a few ingredients to use. You might want to do some conversion, this is a Russian recipe site and they use the metric system for measurements. One note about the recipe, I don’t fry the meat. I bought one rack of ribs, boiled it with onions for 3 hours. Then, I would the meat off the bone and grind it. Then, fry onions, and add to the cooked macaroni and meat, along with butter, salt, and pepper. Toss all together. This is one of my fav dishes ever.